Located in Princes' Business Skyline, this premium office space is close to petrol stations, cafes, shops, restaurants and banks with Giani's icecream located nextdoor you are never too far from a cooling reward when you've been hard at work all day. You will find startups, freelancers and bloggers in this space. With opportunities opening doors for your business left, right and centre, you will love working here. Understanding startups, helping them grow and providing mentoring opportunities, this space is a one stop shop for all your business and networking needs. Office space prices ranging from ₹8000 - ₹12600 per month. 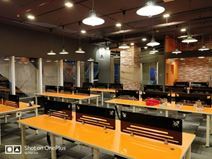 A co-working space catering to start-ups, entrepreneurs, and freelancers, with a venue for awesome events, training, workshop, and meetings. Plug-and-play solutions that can be rented on a daily, weekly or monthly basis, with access to facilities and amenities including storage lockers, WiFi, and so much more. Nearby amenities include food and beverage venues, hotels, religious sanctuaries, medical facilities, land transportation options. 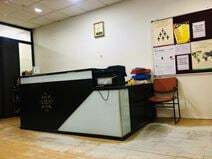 Opposite the High Court and City Centre Building this professional business centre provides a range of flexible office space ideal for businesses of any type or size on MG Road, a major business hub within the old central business district area of Indore. Just 1.5km from the railway station. These offices are located in Indore, the commercial capital of Madhya Pradesh, which is home many manufacturing and service businesses. This quality centre is close to hotels, retail and restaurants.